Communication perhaps is not the strongest force in shaping our societies but certainly one of the basic elements of change. 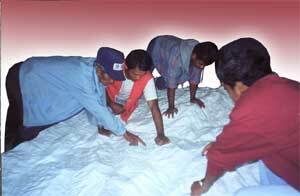 Spatial participatory tools can be strategically brought in to reinforce bottom-up development and collective decision making. Like a universal language based on colors, shapes and dimensions, P3DM is a powerful communication means which helps bridging language, education and cultural barriers. Human cognition includes sensation and perception, thinking, imagery, reasoning and problem solving, memory, learning and language. Location, size, distance, direction, shape, pattern, movement and inter-object relations are part of the spatial world as we know and conceive it. Cognitive maps are internal representation of the world and its spatial properties stored in memory. Frequently referred to as mental maps, they allow us to know ‘what is out there, what its attributes are, where it is and how to get there’. Cognitive maps are distinctive to individuals. They are not inclusive like a cartographic map with a constant scale, but consist of discrete, hierarchically-organized pieces determined by physical, perceptual or conceptual boundaries. Spatial knowledge e develops in humans through three progressive stages including landmark knowledge, route knowledge and survey knowledge. The first one refers to the capacity of memorizing places in relation to an event, the second to developing the sense of ordered sequences of landmarks. The last and more progressed stage is the one where the knowledge embraces simultaneously more locations, their interrelations and allows for detouring, shortcutting and creative navigation. (Montello 1997). Among the different visualising methods (e.g. sketch mapping, transect diagramming, participatory aerial photo-interpretation, relief modelling, mapping, etc.) used to spatially reproduce people’s knowledge, Participatory 3-D Modelling (P3DM) is the one which – by adding the vertical dimension and using simple communication means (colours, shapes and dimensions) – offers ample opportunities for surfacing “tacit” knowledge and for merging individual life-worlds. One of the reasons that tacit knowledge is being surfaces during the P3DM process is that the relief model helps different elders reflect on their own knowledge and listen to each other. It makes tacit knowledge become coherent and identifiable for the holders of that knowledge. This can be missed using other techniques. It is the link between memory, land and maps which creates a particular focus. Provided adequate facilitation, its 3-dimensional nature enhances discovery learning through sensorial (visual and tactile) experiences, stimulates confrontational feedback, which in turn promotes debate, and frequently generates shared knowledge in visible and “tangible” formats. In addition, by providing a “bird’s eye view”, a relief model contributes to widen the participants’ evaluative frame of reference on spatially defined issues (e.g. dynamics of linked ecosystems, hydraulics of watersheds, boundary issues, etc.) thus stimulating active learning and analysis. In other words it helps understanding ecological and social dynamics which go beyond the cognitive boundaries of the individual.